WHY HAS THE PSC REGISTER BEEN IMPLEMENTED? The PSC Register has come into practice to make information such as who owns and has authority within UK companies more easily obtained. This will be an advantage to future customers and potential investors, as well as making investigations into money laundering more straightforward. The only companies exempt from this requirement will be those who already provide information regarding ownership of shares under the FCA’S disclosure and Transparency rules. WHO IS A PERSON OF SIGNIFICANT CONTROL? Holds 25% or more of the company shares, either directly or indirectly. Holds 25% or more of the voting rights within the company, either directly or indirectly. Has the right to appoint or dismiss the majority of the company’s board of directors. Holds substantial power or influence within the company. Holds substantial power or influence over the partners within a firm or trustees within a trust, of which the firms or trusts in question are not of a separate legal entity, and the partners or trustees would otherwise meet the other stated conditions. A person with significant control is required to inform the company within one month of obtained this position. All companies will be required to provide a PSC Register, recording accurately and frequently the details of the appropriate persons. They must also file all the information at the central public register at Companies House. The nature of control they hold. 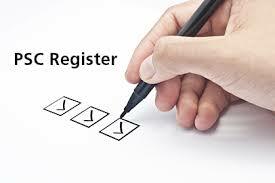 For a price of £30 + VAT, The Company Shop offers the new registers required. For more information, call us on 02890559955 or contact us online.